“How many hours must a flight student fly before he can solo?” I asked my flight-instructor brother. In other words, you do not learn how to fly by reading books and hanging out at the airport talking to pilots. Yes, there are books to read and tests to take, but you will never be handed the control of an airplane until you are fully trained and skilled at flying it yourself. Malcoml Gladwell, in his book Outliers, observed that it takes ten thousand hours of practice to achieve mastery in almost any particular field. He arrived at this conclusion by studying the lives of extremely successful people. The answers were revealing. 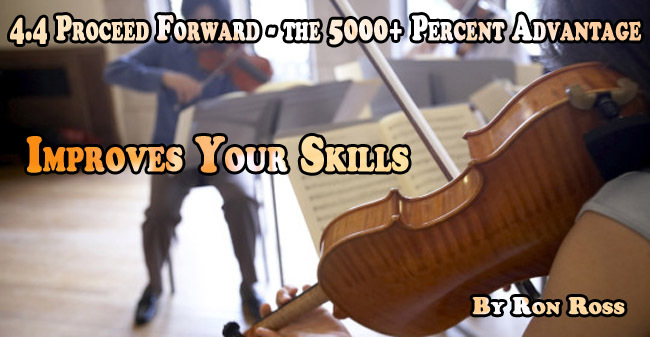 All of the violinists had begun playing at roughly five years of age with similar practice times. But as they grew older, things changed. At age eight, practice times began to deviate and by age twenty, the elite performers had averaged more than 10,000 hours of practice each, while the less able performers had only 4,000 hours of practice. What do you want to be good at; I mean, really good at? What do you want to be so good at that you can do it with great confidence? Whatever it is, realize this: it will take training, preparation, practice and more practice. Our problem is we want it NOW. We want to have confidence NOW. We want to be highly skilled NOW! We want to be an expert NOW! Problem is training, preparation and practice takes time, effort and lonely hours. You want to be good, really good at something, right? Then proceed forward and improve your skills. With some coaching and lots of practice you too can live the rest of your life as a champion!